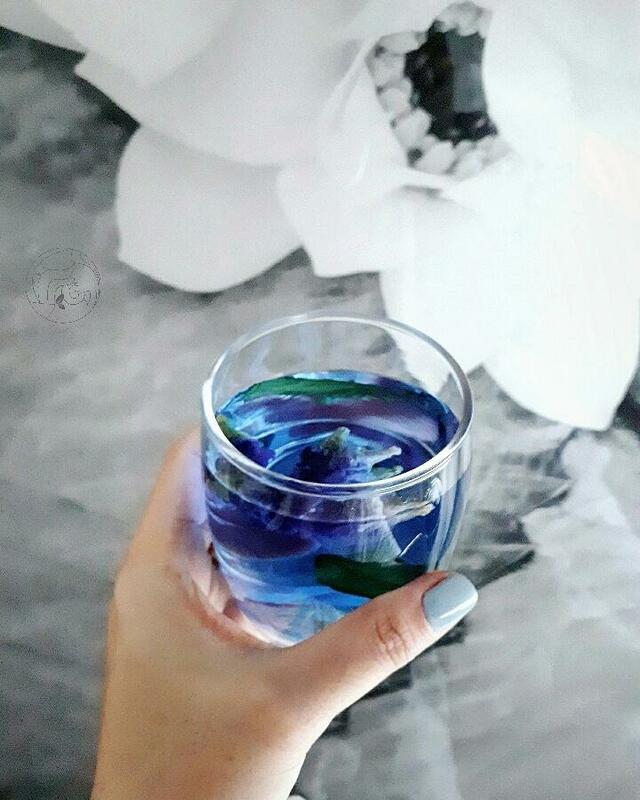 We’re mesmerized by this color-changing, caffeine-free, Butterfly Pea Flower Tea, which has been used for centuries in Southeast Asia, particularly in Thailand & Vietnam. In Thailand, this blue-magenta drink is called nam dok anchan (น้ำดอกอัญชัน). These Butterfly Pea flowers contain a high concentration of a blue-violet plant pigment called anthocyanin, which has a similar compound to red cabbage. When there’s an increase of acidity on the pH level, the drink changes color! Lemon seems to have the most color changing effect. The taste is very mild and slightly earthy–almost negligible. So, it’s a great base for making cold brew. We recommend infusing it with fruits or lemongrass. For this recipe, we’ll be doing a Cold Brew style. It’s incredibly simple and yields a very elegant & balanced flavor. Normally the Butterfly Pea Tea appears as a deep blue color, however since this recipe will be “pre-mixed” with the acidity of the fruits, we won’t see the ‘magic’ transformation of the color from blue to purple–but it’s still a gorgeous tea! Serve and garnish with pineapple & mint. Notes: You can use any fruits for this Iced Tea–which can be a fusion of berries, or with apples for example. It’s very flexible. If you’re entertaining for a big group, we recommend keeping the two components in separate pitchers (Brewed Butterfly Pea Tea & Lemon water) and have the guests pour their own to experience the magic first hand. It’s very entertaining to watch the Iced Tea transform from deep blue to vibrant pink right before their very eyes. And there you go, Abracadabra!